Monday Feb 25 at 1:30 pm in Senate conference room 352. SB19-072 Bill Of Rights Protected Person Under Guardianship. Wednesday, February 13, 2019 01:30 PM Senate Judiciary Committee, Senate Committee Room 352. Senator Holbert, Senate Minority Leader, is to be commended for taking the lead on this bill, followed up with addition of Rep Ransom and Rep Melton, to highlight the dire need to reform guardianship of at-risk adults. Colorado currently lacks safeguards and oversight of Legal Guardianship in County Probate Courts. State of Nevada's Supreme Court Justices got involved, with similar concerns, and their legislature passed Guardianship Reform. SB19-072 is modeled after Nevada's Reform (click here), as a means to shine light on Colorado's dire situation. What is this Office Of Public Guardianship Pilot Program (OPG)? The original bill language simply removing the requirement to raise $1.7M before being able to hire an Executive Director, which would be presumably at no cost to state. As of publication of this newsletter on Sunday Feb 10th, the original version of HB19-1045 was on the bill website. However on February 7, 2019 at a stakeholder meeting, Rep Snyder shared that there will be amendments to ask for funding of the pilot, likely about $2M, TBD as the fiscal note is not yet complete! As of publication of this newsletter, neither the amendments nor fiscal note for 1045 had been finalized. Future versions will be updated on the bill page online here. HB19-1045 will be vastly different bill than originally proposed. And it comes with a huge price tag in the area of $2M. Stakeholders, including myself, have been participating and up to date in OPG Commission meetings for over a year. Precedent Setting Funding: Colorado Joint Budget Committee members raised the concern on September 20, 2018, when they voted down a supplemental budget request for the OPG, that if the JBC approved funding after they failed to secure gifts, grants and donations there could be a long line out into the downtown streets from other legislation, also wanting state funding after they too failed to raise gifts, grants and donations. Audio can be found here, scroll to Sept 20, 2018. Funding the OPG pilot creates an inherent need to continue future funding. There will be OPG wards (CO statutory term for people in legal guardianship) from the pilot. Won’t the state have to continue to support them? Will that fact put the legislature in a position of feeling compelled to continue the office? The eventual state wide OPG was estimated to be at a cost of $8-10M a year, several years ago from a fiscal note, with 81+ full time staff projected. Critical details of the pilot are undetermined. There is no evidence based data, a new JBC requirement, that reflects accurate numbers of people in need of OPG. What methodology and tools will be used? What controls are in place for comparison? Will the pilot data be valid? Who will oversee the guardians, of a very vulnerable population? Current statute does not have safeguards or oversight of guardians. The OPG requires more thoughtful and inclusive planning in an open and transparent process, not passing it all forward to the future Executive Director. Per discussions on February 7th, 2019 with current OPG chair, all details of OPG operations will all be left to the discretion of one person: the future Executive Director of the OPG. There are no checks or balances to that power. The hiring of the Executive Director will be likely be a private process with the Commission, conducted in closed Executive session with no Sunlight of Transparency. (OPG often goes into Executive Session for discussions). Shari Caton, Esq., the former OPG Commission Chairperson, recently resigned. Stakeholders asked for clarification on process for appointment of the new commissioner, questions which have gone unanswered. An Open records request of Colorado Adult Protective Services produced a document showing that 600+ at -risk individuals are in a conflicted relationship with County APS serving as both their guardians, and case investigator. Many stakeholders believe it would be most responsible to hit the PAUSE button on funding HB19-1045 and focus on guardianship reform that will produce safeguards, oversight and current best practices. The high cost of this initial pilot of $2M is a big demand. Many at the capitol perceive the launch of OPG as a means to create unnecessary layers of government, which are lacking in transparency, which could lead to harmful, unintended consequences. It was heard in House Public Healthcare and Human Services. The audio is here, scroll down to Feb 1, 2019 it was the first agenda item. At the opening of the hearing, Rep. Liston made a rare super motion. A super motion allows the bill to be voted on in the affirmative, without testimony, and be sent to the Full House for a vote ("committee of the whole"). Thankfully, Committee Chair Rep. Singer overruled the motion, stating that four individuals had signed up to speak in opposition had waited for hours to speak, and he felt they should be heard. The committee heard public concerns of the bill expanding investigatory power of Adult and Child Protective services since the bill proposed opening information sharing between these departments. The bill does state that individuals shall have access to their records, but the requirements make it rare that a person in guardianship that will actually access their records. HB19-1063 passed unamended in an 11-0 vote. It is currently calendared to be heard in Senate Judiciary committee, with public testimony Monday Feb 25 at 1:30 pm in Senate conference room 352. Calendars change so it is recommended you check hereonline regularly. Come down and participate. Join me at the Capitol this week. I usually am easy to find with my full size cardboard cut out of my son! The best way to learn the process, is to come attend some committee meetings, experience the environment and also stop by your own legislators' offices to say hello. Check out the a simple "build a testimony worksheet" for those wanting to come to committee and sign up to testify for 3 minutes. These are posted for Jan 30, 2019 under BLOG tab here. I usually have several extra printed out before committee meetings so just ask! A person can also call or email legislators, realizing the sheer volume is staggering for one person and an aide to manage. Face to face is most memorable and interactive. Colorado Bill of Concern: HB19-1063 Opens Sharing of Data between Colorado County Child Protective Service and Adult Protective services. Volunteer Activist and Volunteer Lobbyist. All content is my own, protected by the First Amendment. Please consider the unintended consequences of this legislation. Click here to read current bill language. Yes, we want to get the abusers caught. Currently, Adult Protective Services (APS) can ask to see Children's Protective Services records (CPS) with a judge's order, when there is good cause. My personal concern is the universal opening of personal data between two distinct programs. I know many families with disabilities who have experienced many false allegations of abuse and neglect of their disabled loved one. Anonymous reports are often from people who do not understand disability, especially living with intellectual or developmental disabilities. Other families have expressed their belief that an anonymous report to Child Protection Services was an act of retaliation, often for speaking out. The bill also creates protections for the reporting party, stating there must not be any identifying information about the person who makes the report to APS or CPS and even limits the disclosure of information, even with a court order. The open access and expanded investigatory power has the potential to vilify families and data could be used to remove and place their loved ones, at-risk adults, into guardianships by strangers. As to the opening access to court records, the language doesn't in practice offer much. Access is restricted to the ability for the at-risk person to request their own record, and only if the person is not deemed incompetent. If they are incompetent, only the guardian or guardian ad litem may request the records (which in some counties is also the APS worker, a dual role and conflict of interest). What do you think? Can you see unintended consequences to sharing of information that could cause unnecessary trauma and mental anguish? Please express your thoughts to lawmakers ASAP. HOW CAN YOU EXPRESS YOUR CONCERNS? People can attend committee in person and speak on this bill on Friday Feb 1, arrive early 10am. It is upon adjournment, (when they are done on the floor of House) @ House Public Health Care & Human Services Committee in House Committee Room 0107, on ground/basement level by the elevators. "Upon Adjournment" means when the House members come off the floor, it can be as early as 10 or much later. It is best to come early. The committee agenda is here and HB19-1063 at time of this publication, was scheduled first on the agenda. Subject Line: Bill HB19-1063 Data sharing CPS APS in PHCHS committee 2/1. Include your reasons and contact information. The chair of the first committee is Rep. Singer 303-866-2780. Arrive early, parking and security take time. Remember that you only have 3 minutes generally. Fewer words, spoken slowly with some cadence to your voice are most effective. Stick to your points. You can always type up and print out copies to distribute (5 for senate committees, 11 for house committees, if it is a joint committee, check online how many to bring). It is not uncommon to have committee members on computers or phones, the more compelling your story to grasp attention, the better. Members often step out of the room, to talk to someone or present their own bill to another committee. Clearer, simpler words with cadence when read are helpful. The goal is to take a position of support or opposition and be memorable to the committee members. Parking: I usually can find a meter on Lincoln, between 12th and 14th Ave, up to 2 hrs. Security There are metal detectors as you enter. Disability Access to capitol is best on south side 14th Ave between Lincoln and Grant Streets, it is an accessible entrance. 1. ”Mr. or Madam Chair, members of the committee, thank you for the opportunity to testify to you today. 2. My name is __________________ I live in ___________(city or county) and I oppose this bill. 4. I am here today to oppose this bill. 4. Thank you Madame/Mr. Chair and Committee members for allowing my testimony today. 5. In conclusion, I urge you to vote no on this bill. Ask to get on their email list, or follow them on social media to find out when they are doing townhalls/coffee meeting in your local area. Contact them about any bill that is important to you. Get involved, come spend a day meeting people and attending meetings prior to the day of the committee meeting. The bill is read and heard in committee(s) in both chambers, and passed by both full bodies of each chamber, then sent to Governor for signature. NEXT EDITION: Bills of Interest and their committee calendar! The session is heating up, bills are stacking up to be heard in committee. The session will wrap up in early May 2019! Fewer words, spoken slowly with some cadence to your voice are most effective. It is not uncommon to have committee members on computers or phones, the more compelling your story, the better. If you want to share more extensive ‘backstory’ you can write something up separate from testimony, print out but know the longer it is, the less likely they will read it. 2. My name is __________________ I live in ___________(city or county) and I support OR oppose this bill. 4. I am here today to support OR oppose this bill. 5. In conclusion, I urge you to vote yes OR no on this bill. Fraud exposed in Colorado's first ever State Legislative Audit of all 20 CCBs! Released on December 1, 2018 in Legislative Audit Committee. If HCPF had limited the unit billing to just the hours a Case manager worked, the state would have saved $1M in just one year. CCBs have responsibility in this area too, they are medicaid providers and should not bill for hours beyond what case managers work. Call and report it to the Federal Office of Inspector General at 800 447-8477 . This is a misuse of public funds. The Colorado State Department of Healthcare Policy and Financing has FAILED to exercise oversight of these funds. Funds need to be refunded by CCBs to State and Federal government. We need further investigations and prosecution. SB16-038, Regarding the Transparency of Community Centered Boards included a state compliance audit. Now, three years later, Office of State Auditor report will release it on December 3! The Colorado Legislative Audit Committee Hearing for the CCB audit is scheduled for December 3, 2018 from 10 am to 12:00 pm and then again from 1:30 to 4:00 pm. The 20 CCBs and the Department of Health Care Policy and Financing will be at the hearing to respond to our recommendations. While the hearing is open to the public, there is no time for public comment. We are still working on where the hearing will be held. It will also be live streamed. It will be posted on our website soon. Yes, there is a state-wide issue of services and facilities for our difficult at-risk adults (which by definition, in current statute, includes ALL adult persons with Intellectual and Developmentally Disabled). However, this proposed Office of Public Guardianship is a solution looking for a different problem. The hospitals don't want it enough to donate to this proposed pilot program. I have been attending these "Longest monopoly game" meetings for almost a year. Story includes quotes with Maureen Welch who feels strongly that this Office would have harmful unintended consequences as the current Guardianship Statute has no safeguards or checks and balances on guardians. Those need to be addressed first in Statute prior to funding an entire office using those statutes. Colorado Legislative Audit Committee has placed Colorado Adult Protective Services (both State and local County Units) in the queue for an Office of State Auditor Performance Audit. This audit was ordered after an unprecedented level of constituent complaints about Adult Protective Services' unchecked power, ability to get emergency guardianship of persons in two days without the person even appearing in court. How statute allows these units to operate without transparency with suppressed court documents. The unlawful kidnapping of at-risk adults (which by definition in statute includes all people with Intellectual and Developmentally Disabled) with no formal testing of capacity must end. Stripping people of all their rights with no due process is not acceptable. It is right and good that our legislature is responding. Remember that contacting your legislator is powerful: you can find yours at https://leg.colorado.gov/find-my-legislator. Denver Auditor Office will do a follow up audit of Rocky Mountain Human Services, Denver's CCB in first quarter of 2019. The needs survey that Denver Human Services contracted to a private consultant revealed a great lack of knowledge of the local mill levy funding for Denver County Residents with Intellectual and Developmental Disabilities (projected to be $17.5 Million collected from property taxes in 2018). Constituents continue to express difficulty in accessing funds and new restrictions on uses imposed unilaterally from RMHS without any input from the Community Advisory Council at RMHS. Denver City Council members have heard concerns and are interested in results of Auditor Tim O'Brien's audit report. The Colorado Civil Rights Division (CCRD) is a effective tool to push for compliance with the Colorado Anti Discrimination Act (CADA). Protections under CADA include Public Accommodations requiring full and equal enjoyment and participation for all. Their jurisdiction also covers Housing and Employment. The number of cases grow by the week. Explore by attending their free trainings. Attorneys are not required, state staff will assist with filing charges. More CCRD details on my Blog Post of newsletter dated July 4, 2018. Find at www.changecoidd.com where all these newsletters are archived under BLOG. Protected under the First Amendment, freedom of expression. It's time to transition to a competitive process to ensure quality, conflict free choice of services for Denver residents with Intellectual and Developmental Disabilities (IDD). Denver has a unique property tax (or "mill levy"), which has always gone to one organization for past fifteen years. Currently, an incredible of $17.5M is projected for 2018 Denver IDD Mill Levy. It is better to look at trying something completely new, rather than repeat what has already been done with limited success and unspent funds the last two years. Denver Ordinance was updated in early 2017 to allow the City the flexibility to contract with any organization or company, interested in meeting the unmet needs of residents of Denver for this $17.5M a year. Yet RMHS continues to be the sole agency of Mill Levy funds. Many local agencies are very interested in serving the IDD. Currently they must go to RMHS to ask for funding and must agree to their oppressive requirements, including IDD contractors to surrender rights to all their intellectual property. This limits who might apply to have to get paid through RMHS. It also places control of multiple millions in a private non profit's leadership top officers, most likely creating a relationship of fear and control. Access to individual funding for unique requests ("client assistance funds") is arbitrary, and unclear with case managers acting as gatekeepers, issuing verbal denials rather than true processing of requests. This calls into question all the client assistance approval/denial rate data shared from RMHS to Denver in the Mill Levy Reports. It also leads to question of how much need is not going to be requested, as word on the street is the process is long, difficult, requiring a lot of time with multiple letters just to be told no. It is well past time to move Denver IDD Mill Levy into the 21st century and out of the centralized "mother-may-I", human services with FTE heavy monopoly at RMHS. Currently there is no room for innovation when one agency and people at the very top of leadership calling all the shots. New opportunities might emerge with competition. There is an established company with local presence, interested in making a proposal of an automated payment processing system, with client empowered access for use of approved funds. Open an RFP process for innovative ideas, not currently those categories of services already available. It takes a lot of chutzpah for RMHS to ask for 88% of the total tax fund given all their history, past and present. 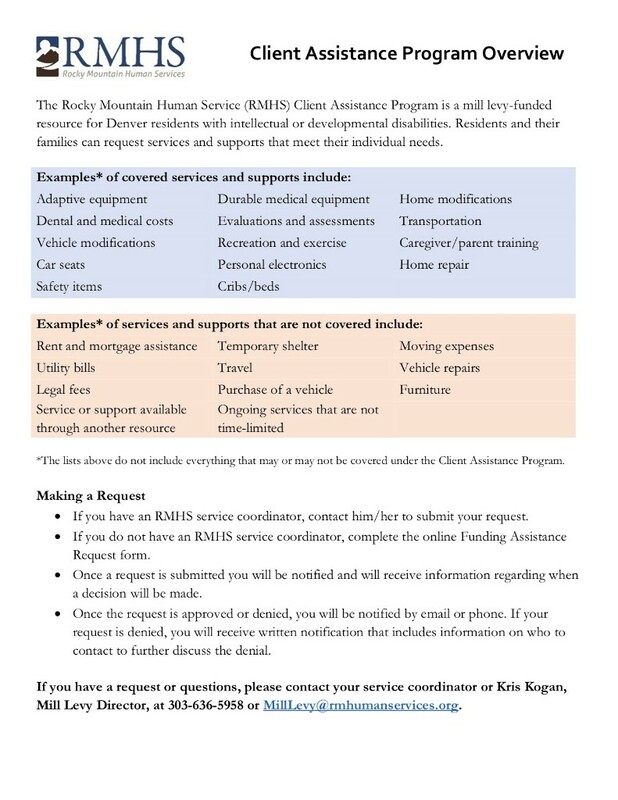 Without a competitive bid process, this a simple Money Grab which grants Rocky Mountain Human Services' (RMHS) huge power over services for a vulnerable population. Not only does RMHS have control to all the millions, and keep $8M a year for their own organization, now they have the gall to request a raise the allowable administrative/overhead from 15 to 18%? Unbelievable! 1. It is prudent to make a shorter term contract, to examine several forthcoming audit reports on Rocky Mountain Human Services (RMHS) coming forth in next year. Also, Denver Human Services has a consultant working on a needs assessment due in July. State: The 2015 Denver Auditor office report cited major deficiencies which triggered state legislation for increased transparency and Office of State Auditor is wrapping up a state wide audit of all 20 CCBs, including RMHS, per SB16-038. Local: The Denver Auditor Office has RMHS scheduled for an audit team in first quarter of 2019. In my late March 2018 newsletter, I shared that RMHS allowed funds from mill levy to be used inappropriately. Both Denver Human Services (DHS) and RMHS failed to ensure recipients were both Denver residents with intellectual/Developmental Disability (IDD) status. 2. RMHS Discriminatory Treatment: Several State Civil Rights Division complaints at Colorado Civil Rights Division have been filed against RMHS, more are coming, and at least one is cross filed at EEOC (Federal level). Many are too fearful to file these due to the centralized control of RMHS and the monopoly of controlling Mill Levy dollars. 3. The word on the street is that RMHS likely has misused funds from the Denver Mill Levy. Allowing one organization and its CEO/leadership team, far too much control over $17.5M a year in flexible funding might by many, be considered a very high risk move. It allows one organization, already with a monopoly of captured IDD clients with no local choice, to have unwieldy power over access to these funds by a vulnerable population, the IDD. I, Maureen Welch, had raised concerning findings at a board meeting in May, and CFO of RMHS, John Wetherington, stated that “Denver Human Services said it was ok" that some funds were not used for Denver or IDD. CEO at RMHS, Shari Repinski, stated that Denver Human Services auditor was constantly monitoring. Approximately the same time, a DHS internal auditor assigned to this RMHS contract, Cynthia Hinojosa, went on leave and now “no longer works for DHS” (per Justin Sykes of DHS). Official details are not available, since it is a human resources issue, but the action raises eyebrows about who is protecting who and if there is the cover-up? 5. The Community Advisory Council (CAC) at RMHS is bogus. The City was lead to believe that this group would have input into the use of mill levy funds when in fact, they only learn of expenditures/decisions after they are already made. Several members have expressed frustration and asked what their purpose was, if their areas of expertise were not consulted before RMHS made large commitments for these dollars. 6. Open Denver Mill LevyFunding to a competitive Request for Proposal (RFP) process. When the Council codified the Mill Levy for IDD into Ordinance, it created flexibility for City contracting with other with other organizations to meet the unmet needs of Denver residents with IDD. The city is no longer limited to using just a CCB, RMHS as it was historically. There will be multiple case management agencies in Denver in the near future per federal Final Rule. RMHS has proven they do not have efficient processes to get money “out the door”, demonstrated by the balance in the cash account of nearly $9M which went unspent in last two fiscal years. 7. Just say “NO" to raising the allowable overhead from current 15% to 18%. Those are millions of dollars that potentially would go into a private non profit, rather then directly reach Denver's IDD residents. RMHS already steers nearly half the mill levy to themselves, about $8M a year for their own services provided (case management, behavioral services, and coordination). The Denver Auditor’s Office expressed serious concerns about overhead cost containment; It was an area of focus in the 2015 Denver Auditor’s RMHS audit report. RMHS appears to be a greedy, controlling and oppressive gatekeeper. As a pass through, they wield their power and control, making many individual client requests so lengthy and burdensome so many just give up. For community partners, RMHS takes high overhead to act as no more than a “pass through”; Mill levy Subcontracting Community Partners are forced to sign over their intellectual property to RMHS and take on huge insurance policies. Why not allow Community Partners to respond to RFPs for services directly rather than have a “mother-may-I” relationship to RMHS, costing 15%? 8. RMHS announced it will be awarded the CDHS “transition specialist” contract for nearly $5M a year to transition patients from the state’s two mental institutions Fort Logan and Pueblo into community living. They is a shiny new revenue source for them, in mental health services. Many in the medicaid community of providers have expressed surprise and wonder about how RMHS won this lucrative contract, since they don't have expertise in this arena. Attend a community meeting Monday June 11th afternoon at 4:30 pm or at 5:30pm to share YOUR opinions/experiences about Mill levy and Unmet need, hosted by Health Management Associates (HMS) . HMA was hired by Denver Human Services for $50,000, to conduct and submit a needs assessment. Public meeting on DHS' needs assessment of services for residents with intellectual and developmental disabilities (I/DD). You may also join the discussion via phone at 1-877-668-4493 (access code 732 060 503#) or via Webex (http://bit.ly/2sB8lzx). In addition, the first presentation session of the meeting (4-5:30 p.m.) will be broadcast via Facebook Live from the Denver Human Services Facebook page. Open to the public, providers, people with intellectual or developmental disabilities, and other stakeholders. Survey results from the City and County of Denver’s Assessment of Services for Denver residents with I/DD will be presented at 4 p.m. and 5:30 p.m.
Attendees will have the opportunity to react and provide additional feedback after each presentation. Questions? Contact Robyn Odendahl, Health Management Associates, rodendahl@healthmanagement.com. A sign language interpreter or open captioning via CART provided upon request by contacting SignLanguageServices@denvergov.org. *Briefing, Public comment and Action will be taken in Committee on June 13 at 10:30 am City and County Building 1437 Bannock St., Rm. 391 Denver, CO 80202. *Comment limited to two to three minutes a person. Fine to bring written hand out. To sign up to speak, early, before 10am if possible, sign up closes at 10:15. There is a max of 15 minutes total of comment allowed, so get there early to make sure you are top of the speaker list. *If you cannot come but want someone attending to read a written very short statement, that is acceptable. They also can submit written statement for you. And you can email the committee staff contact Shelly Smith shelley.smith@denvergov.org or call Phone: 720-337-2000 and ask for her. Mountain Human Services, over two and a half years. (Three segments are delineated in this contract, 1- initial five month contract for rest of 2018, a second optional extension for 2019 and Third optional extension for for 2020.) According to staff, this contract allows for Denver Human Services to extend the contract under this bill for these two additional, one year terms. 18-0589 Ordinance Change: Amends Section 53-550 of the Denver Revised Municipal Code (DRMC) to authorize the use of dedicated mill levy revenue to provide services to children up to age five with developmental delays and people seeking a developmental disabilities or delays determination and to increase the allowable administrative and overhead percentage to 18% (currently is 15%) of total expenses through 2020. 3. Link to ordinance change request (18-0589 to raise admin/overhead to 18% and includes updated draft language. Secret Gestapo tactics of Adult Protective Services in Colorado Counties - callous disregard of Colorado rules, regs and legislative intent. They simply do not want to believe it. I share real world experiences, from the community. For months, and for some boards, years, I keep coming back. No matter how unpleasant those "chosen" voting members make it, I return. Why? They are more committed to believing their version of "truth" than reality. My comments contradict their version of the truth, which is threatening. Systems, like state government and their privatized sevice subcontractors- only want well behaved stakeholders who "know their place" and after voicing their concerns, they nod in agreement in group think and go away, to never return. When stakeholders present information which threatens or questions the systems, they are are treated disrespectfully, scolded for sharing new information, and their time is cut short when others are allowed to go on for twenty minutes. Regardless of this patronizing, dismissive and discriminatory treatment, I will keep showing up and speaking out. Yes, we need adult protective services to protect the most vulnerable. Sadly there are many real cases of abuse, neglect and exploitation. However there is a need for guardrails to avoid unintended consequences. The content of my public comment threatens many, because I share reports from the community which trigger a defensive, emotional response because these challenge what they believe is the "truth". My testimony is direct, an untethered independent voice with clear "asks" to increase process, transparency, accountability and justice. I work with many, many families to voluntarily guide them, free of charge, to get what they need and to which they are entitled. This activism covers many silos: school systems, medicaid/waiver benefits, Social Security Administration, local mill levy funding and more recently, Adult Protective Services. Many comment that I am much more helpful than the paid people supposedly there to help. My facts are based on my interactions with individuals and their families who live with disabilities. People trust me with their most disturbing experiences. It continues to amaze me that few impacted members of the public participate, but after being treated poorly, I am reminded that most would not subject themselves to these negative experiences. Ultimately, it threatens the status quo and people in positions of power prefer to dismiss us as "a couple of advocates" rather than care enough to welcome, listen and respond. 1. On May 4th, 2018, during the board meeting, State Board Member Bernie Buescher, waged an attack and criticism of my Newsletter that compared Adult Protective Services operations as "Gestapo like". His feeling of being offended was more important to share than the violations of rights of the At Risk Adults that I highlighted. 2. During this same May State Board meeting, after Bernie's scolding my newsletter, per first amendment right to free speech, no one else at the table, neither the Board Chair David Ervin or CDHS Executive Director Reggie Bicha, a governor appointee, said anything to support a stakeholder in exercising their right to free expression. This makes the entire board culpable to discouraging a member of the public from sharing real experiences from the community. 3. Cognitive Dissonance is systemic at State Board of Human Services (CDHS). How does this injustice happen with Adult Protective Services (APS)? APS is an administrative program. They do not rise to criminal justice standards of "beyond a reasonable doubt". Yet judges overwhelmingly defer to their recommendations regarding guardianships based on questionable "investigations". Be aware that per Colorado Rules and Regulations, APS can investigate anyone, without them being aware because notifications are only made after a substantiation. APS often tries to pulls in everyone for interviews, from other family members, providers, neighbors, friends and case managers. This can even be distant people, remember that they are looking for anything that can be twisted or interpreted to validate their position. All this information gathered by County APS is required to be recorded in a data base called the CAPS system (for Colorado Adult Protective Services). They have a similar data base for Child Welfare called TRAILS. The information in the data base can remain, in perpetuity, without anyone's knowledge. Local Counties run the APS operations, with State supervision. APS training of investigators is minimal. The APS "investigators" are trained with an online Pre Academy (PAW) workbook, which is based in elder research. Then they eventually attend a 5 day training "Academy" (sounds like pseudo- law enforcement) hosted by the State APS staff (to be expanded to 7 days), and then receive laterally by coworkers in on the job training. The state declined to provide much detail as to the content of this APS "Academy" besides a short basic outline. These local APS investigators are making recommendations on their judgement of cognition and competency (which is actually a separate legal process in a court proceeding) without appropriate credentials. APS investigators are also conducting "interviews" of complex individuals with IDD. They are not trained in the complexities of such forensic interviewing, usually done by a licensed psychologist with special endorsements. They fail to offer ADA accommodations and denied individuals the right to counsel, stating those with IDD do not have capacity to select legal representation. APS interview operations are wholly inappropriate for this IDD population. One local psychologist shared that he now is treating patients with IDD for the trauma from these APS interrogations. Once all this information from questionable interviews are entered in the CAPS data syste,, they can and will use this past information to assist with fabricating their false narrative. Then APS waits, ready to pounce when they see an opportunity. Common situations include: treatment in an Emergency room for routine interventions, a hospital admission, a filing for voluntary guardianship by a family member or a short term voluntary respite stay. they seen an entry point. They file for emergency guardianship and the judges seem to believe them and rarely consider or engage the person with IDD or their families in courtrooms. If one doesn't have funds for an attorney to fight for their loved one, they are at a huge disadvantage. After July 1, 2018 there will be a registry of substantiated "perpetrators". Family caregivers/members and seventeen year olds are not excluded. Employers can submit names for cross check with this Registry to check an applicant. Clearly there are many abuse, neglect and exploitation cases which are quite real and valid, worthy of substantiation. However I am hearing more and more cases where APS had pulled adults from their own family home, to have County APS get guardianship awarded by a judge, based on mistruths. Then County APS as guardian becomes their captors, dictating in which host home they reside, change their service plans/day programs, restrict or forbid contact with others, and monitor phone and visitor conversations. The person with IDD loses all their rights, their dignity and their right to privacy. From cases shared with me, APS appears to targets those struggling with cost of living, often single parents, and those they know will be unable to hire legal representation. Emergency Guardianship is supposed to be life-threatening situations, but County APS is being granted this for much less. Guardianship by statute is only supposed to be over placement (where they live) and medical per statute. Yet APS is taking over all aspects of their "ward's" life: including restricting visitation, concocting charges against family members to keep them away from their family member with Intellectual Disabilities and not informing family members where their loved one even lives! Wards in guardianships DO HAVE RIGHTS. By statute they have a right to have their preferences considered regarding who is their Guardian and who is their lawyer. Yet many judges fail to listen to ward or their family at all. They all default to the local APS staff and county attorney. This is so wrong and unjust. Information is power. Protect it. Tell those close to you to be wise and to share as little as necessary. Assume there is no privacy. Know that what you tell one person in a system will likely get to another, breaking confidentiality. (IE some Providers, CCB to APS to HCPF to CDHS to Judicial Branch). It does not help cases to cooperate with APS once they have set their machine into motion. Never sign anything. Tell your loved one with IDD and people close to him/her, to never sign anything. Also practice saying "I do not to talk to anyone alone, and I want a lawyer." The Americans with Disability Act (ADA) applies for accommodations during APS proceedings. Ask for the accommodations needed due to disability status. It does help to refuse to talk to APS until your lawyer is present. Yes, even if you have done nothing wrong. The person with IDD has rights even if there is a guardian, including legal counsel and input to their guardian appointment. Cases stopped in tracks were those who got an attorney for the person with IDD before any interview occurred, and was told he was to be contacted for anything related to his client. Lawyer up. Don't talk. Information can be twisted and can be used against you. Contact me. I have an intake form to help you organize your case, create a timeline. I also have list of attorneys and also can help you with free options. APS VIDEO Edition, & Millions of Colorado Targeted Case Management mis-billed. 1. Managed Care has poor safeguards, state's $10B annual program. "Colorado officials vowed to improve oversight of the managed-care portion of the state’s $10 billion Medicaid program after a federal audit found poor safeguards against waste, fraud and abuse." "The Colorado Department of Health Care Policy and Financing (State agency) claimed Federal Medicaid reimbursement for some Targeted Case Management (TCM) services that did not comply with Federal and State requirements for fiscal years (FYs) 2014 and 2015." "We recommended that the State agency refund approximately $2.2 million to the Federal Government for unallowable TCM claims". House Bill 17-1284 created a registry for Adult Protective Services. The Colorado Department of Human Services (CDHS) has authority to "propulgate" (write) rules to implement the bill. This process involves several stops at various committees. And after stakeholder concern, they held three evening sessions at CDHS. We have some video short highlights below, from the many hours of meetings. Get out the popcorn! Also more are on the youtube channel, "APS Debacle" . Bookmark it, subscribe, and look under playlists for video queue, organized by date. May 4 meeting details- rule packet 3 to be introduced, with a Board vote at the June meeting. 1:32 clip- Memory issues? This video says it all. Peggy Rogers, Manager of Adult Protective Services at Colorado Department of Human Services, admitted on tape April 5, 2018 there are "MULTIPLE VIOLATIONS" of confidentiality in their units and would "ADDRESS AT NEXT QUARTERLY MEETING". Yet the following day, she shakes her head no! 2 minute clip- Emergency room visits are "red flags" that are listed as reason to investigate someone, and is "watched for" by APS. Yet many are sent to Emergency rooms by their regular doctors with standing orders for chronic conditions. It is inappropriate to train APS employees that visits are reasons to investigate. Doctors are mandatory reporters and already report suspicions to authorities. 2:59 Clip- Preponderance of Evidence is a low threshold, former State Senator Rob Hernandez during his public comment, is abruptly interrupted, out of order, by Assistant Attorney General Ted McCombs without the Chair's acknowledgement. Concerns regarding allegations My concerns results from the discussions on floor of senate earlier this week, and some allegations. I don’t want this board to use these rules to fall into a legal, PR hole that the legislature has fallen into…. Video credit to David Owen, Family Advocate, Camera man extraordinaire! Child Welfare rules state that the "age of culpability" is 11 years of age. In proposed rule packet 3, scheduled for State Board on May 4, minors from ages 11-17 could be substantiated with abuse, neglect, exploitation and self neglect charges. Here is a link to a video clip from March 28, 2018 Stakeholder meeting confirmation HERE. APS violates all civil rights of children, declaring them "substantiated" without access to legal counsel. APS violates the Sixth Amendment in the process. The APS administrative investigation is secretive, these situations would likely also alert Child Protective Services action. Children are children. Let them be that. They learn as they grow. They should not be on a blacklist as minors! Let them eat donuts! It is concerning especially as peer on peer issues are common, and adolescents and especially the intellectually and developmentally disabled should not have an adult label placed administratively. A charge of self-neglect between 11-17 years of age seems preposterous. There is a pattern of CDHS exceeding the statutory language in promulgating rules and stepping out of bounds to write law. The two areas of biggest concern are the severity levels in rule packet 2 (up for State Board vote on April 6) and the age 11 as "age of culpability" in rule packet 3 (presented to State Board on May 4) . Neither take direction from HC17-1284 but rather they are replicating Child Welfare rules. This is not the intent of the legislature. Family Caregivers and small PASAs can be investigated and put on the Registry as Substantiated "perpetrators" and never see the accusations or investigation information (per the rules, one needs a court order to get access). Also APS can apply for guardianship and change the person's placement, and service plans. Believe it, it is happening now. Your Best protection is to LAWYER UP Remember even if you know you have done nothing wrong. It is best to refuse to talk to APS without your counsel present. This can stop the harassment. Also consider a Colorado civil rights complaint, fast, free, no attorney needed and done online/over phone HERE ! Read www.changecoidd.com past newsletter about Colorado Civil Rights Commission under the News Tab. Colorado Department of Human Services, 1575 Sherman Street, 8th Floor, Denver, CO 80203. General open Public comment at start of meeting at 10 in person or over phone (must give notice for this accommodation). You can also submit written comment to beth.kline@state.co.us . Later, during agenda, public comment is limited to Rule Packet 2 feedback. Please be advised that the time and place for scheduled meetings is subject to change and the broadcasts will only occur when meetings are in session. A "waiting for organizer" message may appear if access to the service is attempted prior to launching of the broadcast. If you receive this message, wait a few minutes and try again. Potential unforeseen technical difficulties may affect availability of the broadcast. After clicking the meeting link, you may be prompted to install the GoToMeetings application. Follow the onscreen instructions, and the meeting will launch once the application has installed. If during the broadcast you lose the connection, click the broadcast link again to rejoin the meeting. If you have any suggestions or comments, please e-mail our technical support team.Live Meeting Broadcasts CDHS broadcasts all State Board meetings. Click to join the live GoToMeeting broadcast. Please be advised that the time and place for scheduled meetings is subject to change and the broadcasts will only occur when meetings are in session. A "waiting for organizer" message may appear if access to the service is attempted prior to launching of the broadcast. If you receive this message, wait a few minutes and try again. Potential unforeseen technical difficulties may affect availability of the broadcast. After clicking the meeting link, you may be prompted to install the GoToMeetings application. Follow the onscreen instructions, and the meeting will launch once the application has installed. If during the broadcast you lose the connection, click the broadcast link again to rejoin the meeting. If you have any suggestions or comments, please e-mail our technical support team. You may be under investigation by Adult Protective Services and not even know it! That is because the rules don't require notification until the end, at point of substantiation. Then to appeal it can take up to 18 months to do an administrative appeal OR one can take APS to court where there is assured due process. The CAPS registry has a low bar for "preponderance" of evidence. Also only APS can actually see the files for, for anyone including persons involved with the investigation, CAN ONLY see their files with a Court Order, which requires a judge. Do you run a PASA? Do you remember the HPE/DXC medicaid revalidation debacle? Many PASAs are still struggling with that and now THIS with CDHS? The Colorado Department of Human Services will have 30 days period before start date (in December of course) for employers to register for the required background checks in Adult Protective Services CAPS system. Then on January 1, 2019 employers will pay up to $35 per employee (this could go even higher if lots of appeals happen) for employment registry check and wait up to 10 days for the manual check. This is the administrative process of substantiating not criminal. Due process with "preponderance of evidence" is severely lacking under CDHS Administrative process. Law enforcement is separate with a much higher criminal "beyond reasonable doubt" measure.